While Canadian mining companies often describe themselves as champions of corporate social responsibility, communities in Canada, Latin America and around the globe are increasingly speaking out about the destructive impacts of mining operations on their lands, livelihoods, heath, and self-determination. Their opposition to mining operations is frequently met with violence, and even assassination. This panel discussion will provide an overview of the impacts of Canadian mining companies, particularly in Latin America, while highlighting the work of local groups and international coalitions to defend the rights of communities adversely affected by mining operations. BENITO MORALES is the Human Rights Coordinator and lawyer for the Rigoberta Menchu Tum Foundation, and serves on the Legal Committee of the Council of Western Peoples, where he is involved in efforts to protect communities in Western Guatemala from the impacts by the Vancouver-based mining company Goldcorp. Benito is Mayan K’iche’. JESUS LARA sits on the coordinating board of the Wirikuta Defense Front, and is a Wixárika (Huichol) artist and a healer. Legally recognized by the Mexican government as natural heritage site and a UNESCO World Heritage site, the native land of the Wirikuta is threatened by Vancouver-based First Majestic Silver. SERGIO CAMPUSANO is the president of the Diaguita Huascoaltina community in northern Chile; his people are being threatened by Canada’s two largest gold mining firms – Barrick Gold and Goldcorp. JEN MOORE is the Latin America Program Coordinator at MiningWatch Canada, based in Ottawa. Prior to joining MiningWatch, she worked for four years as a freelance print and broadcast journalist based in Ecuador. Her research and reporting included in-depth analysis of conflicts arising from Canadian mining expansion. 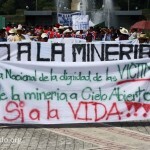 This event is part of Mining Justice Week, May 14-19; for more information: http://miningjusticealliance.wordpress.com, or email miningjustice@gmail.com.